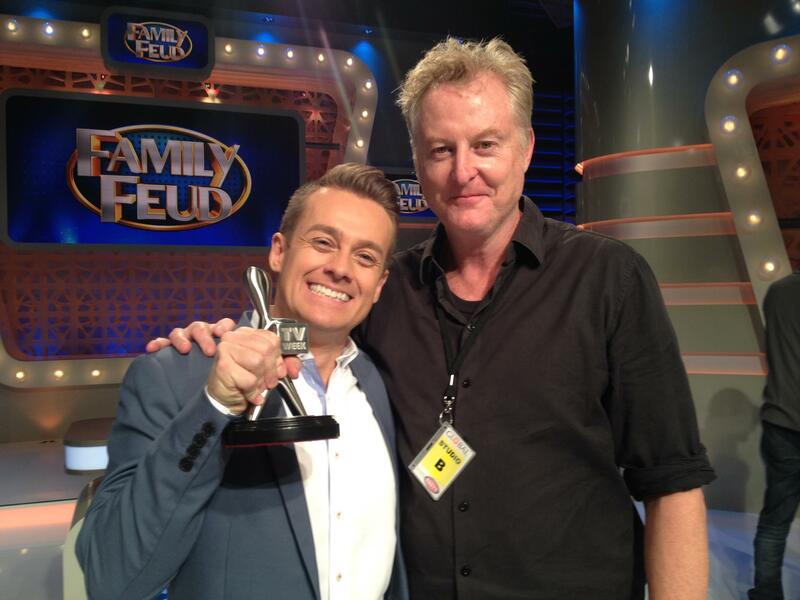 Russell Fletcher and ‘Family Feud’ host Grant Denyer, with the 2016 TV Week Logie Award for Best Entertainment Program! This week’s instalment of my chat with Family Feud studio host and audience warm up man Russell Fletcher includes one of the best strategic tips you’re ever likely to get for playing Family Feud. It’s just below, and highlighted in blue bold, as all the best tips on this site always are. SH: Any words of advice – or warning – for anyone who’s keen to go on Family Feud? RF: It is really fun coming in to the studio because you will actually pick up on some of the nuance that we try and coach people about and that’s all about just staying focused and relaxed. And dealing with nerves, maybe possible strategies. Some people are learning the strategy of getting the top answer and it is a slightly difficult question, they will know the question will be difficult so they pass it over to the other side, in the hope to have time to consult. Because the only time you get to consult with the rest of your family and chat about the answers is when the answering contestants are on two strikes. SO you have that little moment to huddle together and brainstorm, brainstorm, brainstorm… That one! That’s the good one. SH: Does that often work or is it just 50/50? RF: Steals often work. We get very few clean sweeps of questions, very seldom that Grant would be asking a question and they will get all the answers out in one hit. Very seldom. SH: That would make sense. RF: Quite often a team that’s attempting to steal will also fail at stealing. There are always one or two elusive answers that people cannot get from a survey of 100 people; “Name a famous Australian desert”. RF: 43 of 100 people put down “Pavlova“. SH (LAUGHS) Ha! That’s great! RF: Yah. So some questions we can’t put to air. SH: But that’s in the writing, not in the spoken. RF: That’s right. That is in the written answers to the survey. SH: But if Grant was to ask that question verbally it would be a different answer because he wouldn’t be pronouncing “dessert”, he would say “desert”. RF: “Name something that comes in a carton”. RF: Yes. SpongeBob Squarepants…. comes in a cartoon. SH: Oh, for goodness’ sake. RF: Yeah. So the hardest part of the show is writing questions because I am not a fully skilled question writer like your good self, it is a muscle that you have to adapt and you have to develop techniques for writing questions. What is going to be fun to play with? What is topical? What is going to capture the zeitgeist? It is a really inexact science. Questions that are going to be fun for Grant to ask and fun for the contestants too. Sometimes you’ll get Fast Money questions which are so easy for that family, and sometimes you go “wow, that was a hard set of questions”. And that is a really hard judgement call. I write 500/600 questions per year and that is the hardest thing to do. SH: Also to make it answerable enough, and not too hard and not too easy, and not too accessible and not too inaccessible. RF: Yes because it’s not a factoid. There are no facts, it’s not trivia. SH: It’s not right or wrong, it’s not yes or no. RF: People will answer and say the most reasonable things and it won’t be there on the survey. … which all just goes to show how much thought, effort and care goes into the questions you see on the show. Family Feud, like all game shows, is very much an “iceberg proposition”; we only see the 10% that’s “above the surface”. So many hours, days – even weeks – of work has already been done by the time the network delivers that half hour of TV content each night. Which I think’s really cool. It also goes to show the reading levels of many people auditioning for the show. Is that also cool? SH: This is the third year now of Family Feud‘s run on Channel Ten – it started in 2014? SH: It’s been a big success for the network. Has it been renewed through to the end of the year? RF: Well, we’re going up to June, but we didn’t start until the second half of 2014 so we haven’t been 2 years yet. I guess something that the wider audience might not know is that when auditions opened in May 2014, eight and a half thousand families applied and basically broke the system. Because there are only 2 or 3 producers that can work with the contestants! Everyone else has got other jobs. So we closed auditions down immediately so people who applied back then… we are still working through that number of families. That is a lot of people; that is eight and half thousand by four. RF: I am doing auditions tomorrow night in Melbourne and then we have Adelaide coming up very soon. And we just spent a double header this weekend in Sydney with 40 families per day. So we do meet a lot of people. That may be something that the general public might not know. We are about to finish working through that backlog of people. I think they are going to open up the auditions again too. SH: That’s good to know, because I did get a few questions on the Facebook page asking “how do I audition for it?” and saying “I went to the Family Feud website, and it said auditions are currently closed”… Well, now we know why. That’s huge. 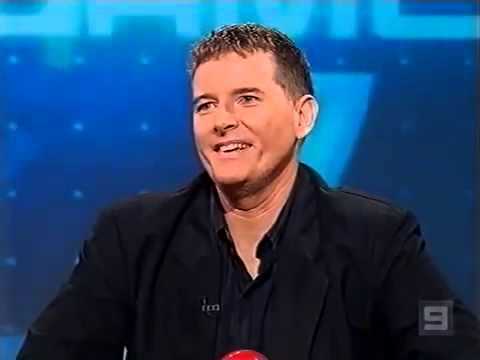 RF: It is always worth maybe emailing Fremantle or maybe having a look at tenplay because we are just about to announce that auditions will be opening. I think that would be really good fun because it almost will be like a different market, like a fresh pool of people come to the show. It is really interesting how many different school groups, media groups who kept coming along for the records, I find that every school teacher, especially the primary school teachers actually play Family Feud with their classes. They do their own survey questions, they survey the class and they have the top answers because it is a fun way of getting to know how everyone thinks. SH: It is a Social Sciences exercise, I guess. RF: Yes, in a way. How do people think? We have a bunch of camera rehearsal questions and there is one question in there: “Name a city beginning with the letter D” and the first thing you would say….? RF: Dunedin’s very good. That is on there. RF: Darwin’s the top answer. RF: Düsseldorf is not zare, sadly, for za cherman peeple. Düsseldorf peeple, don’t be dizappointed. Out of 100 Australians – and I’m not saying these surveys are like Morgan Research or anything – but out of 100 Australians, “Darwin”, “Dublin”, “Dallas”, “Denver”, the greater city of “Dandenong“… Most of our contestants say Denmark. SH: (PAUSE) As a city? SH: The great city of Denmark. Knowing what you know, if you were a contestant on the show, how would you approach it? 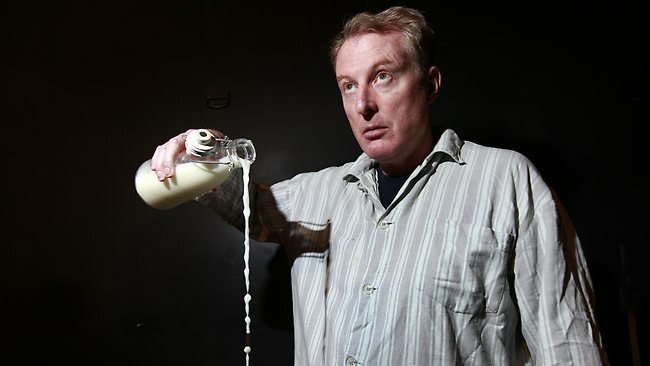 Here’s Russell in his pyjamas, pouring some milk onto the floor. Note: this is not one of his ‘Family Feud’ duties. SH: Just in terms of the practicalities, for those who do get through the audition and then get called in for the studio record day, you generally record five episodes in a day. So you’ll have how many families there? You’d have a couple of spares, wouldn’t you? RF: That’s right. We always have standby families who are Melbourne-based families just in case the car goes off and we need two new families for the next episode, not just one. Or someone who hasn’t been able to turn up. Someone’s been crook, a flight has been delayed for our interstate contestants, all those sorts of reasons. These standby families will get a shot at the next recording day. SH: They get bumped up to the top of the next record? SH: Just on that – you have a morning session and presumably a lunch break? SH: Do they just hang around? RF: Yes, they go for a walk. We do it in South Melbourne, they go up to the Shrine, or they go to South Melbourne Market, or go up to Southbank and come back. Generally they just go and have a coffee. SH: I’ve just got something in my eye, that’s all. RF: (LAUGHS) It always gets a laugh. You know that showbiz rule; “don’t call us – we’ll call you”. I say that at the start of the day, at the end of the morning session. All throughout the morning session I will say that, because we say goodbye to them after the interviews. I might not see them again. So I do say to people – as they are going out the door and also at the end of the day – that they might get a call on Monday to say “Can you come in next week?” They might get a call in 3 months, they might get a call in 6 months. It’s like we develop a CIA profile on these people. SH: How do you mean? RF: Just because they give their photos, what they’re like on the form. It’s a very efficient archiving system of those who are successful and those who are not successful. SH: So, on the day, during lunchtime, if they don’t get a call by…? RF: Enjoy your life. Thank you. We hope you keep watching. So that’s why I make sure that I am pretty entertaining for the first 15-20 minutes when I work with them and we have fun with those exercises that they do, doing the survey. SH: So on the day you record 5 episodes. Are they called there really early? Like way earlier than recording begins? Is there a bit of a wait for them? RF: Oh yes. Some families are called at about 10 AM, and have to make sure they have 5 sets of clothes in case they go all the way. And that they (their clothes) are camera friendly. We’ve got two wardrobe people who help with that. There’s a green room they go into. Standby families are called a little bit later. We do a camera rehearsal at one o’clock and I host that as well. So I just walk them through a quick run-through for each family, where to stand for fast money, etcetera. That’s obviously for all our camera guys and technical people running the game machine. We make sure the buzzers are working and all of that stuff. It is a good little warm up for them to go “Oh, okay, this is what it is going to be like”, before we load an audience in. We coach them to be energetic with it because once the audience is in they will be shouting out “Pass” or “Play” in certain stages as well. So that is fun. I host, camera rehearsals and we just muck around and make sure it is as relaxed as possible and they don’t have to remember too much. And that’s where we’ll leave it for this week. Next week, we discuss Good Contestants versus Bad Contestants, managing energy levels and the time-frame of the actual record day. And I’ll try to include a picture of Russell where he’s not ruining the carpet. Hello! Well, after all the excitement and publicity of last week’s big announcement (rather odd to be so celebrated for something I haven’t actually done yet), it’s now back to business as usual here at HowToWinGameShows.com. And this week, I want to share with you an article – or a series of four articles, really – by Rabbi Geoffrey A. Mitelman, from Westchester, New York, about his experience as a contestant on Jeopardy! The series is entitled My Jewish Approach to Being on Jeopardy. I found Rabbi Mitelman’s perspective fascinating. I’d never seen a faith-related approach to game show contestant preparation and performance before, but his approach is far from exclusionary; these articles are chock full of ideas that can be applied by absolutely anyone who’s serious about winning game shows. Then, in the second article: How I Prepared, he discusses studying, practising, test-playing / rehearsing and buzzer technique – all pillars of a solid preparation regime. he even recommends an app called Jeopscore which allows you to keep track of your score as you play along at home. (I think it’s an Android app. I’ve searched, but haven’t had a lot of luck finding it. Please let me know if you fare better!) There are links to other great Jeopardy! resources here too, such as The J-Archive, the Anki flashcard app, and this great article by Karl Coryat. The third article (The Lead-Up) covers the nuts-and-bolts of the online test, the audition, and receiving The all-important Call; The Call that means you’ve been selected to be on the show. This article is really more anecdotal in tone than the previous ones – it’s mainly outlining that particular part of the Jeopardy! contestant journey… although there is a mention of another training app called Knowledge Trainer, which I haven’t tried, but it does look pretty good! The final article in the series of four – The Day Itself – chronicles Rabbi Mitelman’s in-studio Jeopardy! experience, and as such, contains spoilers. Spoilers which I certainly won’t reveal here. To find out what happens, you’ll just have to go and read it yourself! All in all, this is a really great series of articles for anyone interested in winning game shows in general, and winning Jeopardy! in particular. As we see so often, there is so much more to winning game shows than meets the eye, and the well-prepared contestant will have the edge over the unprepared contestant each and every single time. In this series of articles, Rabbi Mitelman outlines a series of tips and hints that he used, and that anyone contemplating an appearance on Jeopardy! would do well to consider. It’s an entertaining read, it’s jam-packed with useful tips, and I recommend it highly. So thank you again, Rabbi Mitelman, for taking the time to chronicle your Jeopardy! experience so thoroughly – I absolutely loved reading it! I’d like to encourage poor old Sisyphus to look on the bright side, though. Think about it; after all the times he’s rolled that boulder up the hill, he must be really, really good at rolling a boulder up a hill. In fact, if “practice makes perfect”, there’d be no one better at uphill-boulder-rolling in the entire world than Sisyphus. Now, while there’s no denying that Sisyphus’s situation is pretty frickin’ dire, at least he can take comfort in the fact that each morning when he wakes up, he’s going to be able to do what he has to do, and he’s going to be able to do it really well. He’s done it before. Heaps of times, in his case. Which brings me to the subject of today’s post: “You can do it… because you’ve already done it.” This is a really powerful thought. And it’s a thought worth memorising and locking away, because when you revisit it at the right time, and remind yourself of it, it can give you a real boost. A case in point…. Three days ago, I went for the biggest audition of my life*. It was for the lead role in a big new play, that’s adapted from some very well-loved original source material. I’ve never been better prepared for an audition. I learned the lines and did every bit of homework and research I could on the source material – even looking up a couple of unfamiliar words. I wanted to know the source material inside out. I recorded my lines, made them into a playlist for my iPod, and played them back to myself repeatedly, when driving, walking the dog, or just doing jobs around the house. My initial audition was on Monday. I did well enough to get through to the second round, and auditioned again on Tuesday. I did well enough in that audition to get through to the third and final round, which was on Saturday. I did a lot of self-talk during the whole process. And one of the things I kept telling myself, like a mantra, was “you can do it, because you’ve already done it“. I had got through the first audition, I had got through the second audition – I just had to keep doing what I had been doing, and I’d be okay. It was largely a matter of doing the same thing and tweaking it. Saturday’s final audition was a marathon – from 9:00 AM to 6:00 PM, performing scene after scene, interspersed with long stretches of waiting in a theatre foyer and trying not to get too chatty with the 6 other actors who were going for the role I so desperately want. They were my competition. I didn’t socialise with them. I wrote notes in my notebook, I put my iPod on, and just kept myself to myself. I didn’t want to buy into any conversations, potential mind games, or give too much of myself away. One of my competitors didn’t bother to learn the lines of the 3 additional scenes they’d sent us 2 days before the audition. Well, much like a game show, last Saturday’s audition was a competitive situation. I had opponents. And I had to share a waiting room with them for quite some time. I had to wait, to manage my energy levels. When called upon, I had to bring my A-Game, I had to perform in short bursts in a high-pressure, competitive situation. And I had to do it repeatedly, between 9:00 AM and 6:00 PM. So some of my own game show training came in handy. I approached it as I approached my run on Temptation. Although they gave us an hour-long break for lunch, I had brought a couple of muesli bars in my bag, just to help with blood sugar levels. At about 11:00 in the morning, I saw one actor – who hadn’t been called in to audition yet – duck out of the foyer to go and get something to eat; he was “starving”. One minute after he left the building – you guessed it – he was called in to audition. He wasn’t there, so they bumped his audition time back to later in the day. More stress, more suspense for him. And completely avoidable, if he’d just packed some snacks beforehand. If you’ve auditioned for a game show and got through that initial interview, and you’re about to appear on the game show for real, “You can do it… because you’ve already done it”. If you’re on the game show, and you’ve won your first episode, and you’re about to play your second episode, “You can do it… because you’ve already done it”. Or your third episode, “You can do it… because you’ve already done it”. Or your fourth episode, “You can do it… because you’ve already done it”. Or your fifth, “You can do it… because you’ve already done it”. This mantra was exactly what I told myself each time I stepped up to the plate during my 7 night winning streak on Temptation. This mantra is what I tell myself now, as I tweak and revamp my iPhone app Step-By-Step-Story, for a Version 2.0. On game shows just as in life, once you’ve actually got the ball rolling from a dead stop, you’ve already done the hardest part. Once you’ve got some momentum happening, a large amount of the work is already done. I think we need to remind ourselves of that sometimes. We are all capable of achieving truly great things – and once you’ve taken that all-important first step, you’re on your way. So take that step! * At the time of writing, I haven’t heard back as to whether I got the part or not. In case you’re curious, I’ll let you know what the audition was for when the results have been announced. Next week, I’m very pleased to present the first part of my first ever interview with a real live game show creator! I was excited to get a chance to talk to this person, since I’ve never interviewed someone who actually invented a game show before! “But which game show is it?” I hear you cry, “and who is this game show creator of which you speak?”, I hear you ask, in an unnecessarily formal fashion. All will be revealed next week. Just as my eBook How To Win Game shows (still available at the special price of $19.99 AU) will be revealed** if you click this link. See you next Tuesday! ** This has been the latest in my series of ludicrously tangential eBook plugs at the end of my weekly post. Thank you. I’m pleased this week to post Part I of an exclusive interview I managed to record with Blair Martin, who’s an actor, compere, MC…. and two-time quiz show champion. And talk about it we did. See for yourself! SH: Blair, welcome to howtowingameshows.com. BM: Thank you very much. SH: You’re a Temptation champion, but before that, you went on the Australian version of Jeopardy! In 1993, which was hosted by Tony Barber. Just by way of background, what was your life like before Jeopardy! in 1993? BM: Very ordinary. 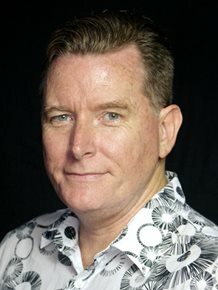 I had been working for a major hotel in Brisbane; The Hilton… just did casual front-of-house work and I picked up the odd performing arts job. Street Theatre at that point was having quite a booming period because of Expo ’88. And from then on, everywhere in Brisbane, Gold Coast, Sunshine Coast, every event decided they needed to have roving characters, because everyone experienced that at Expo. So from about 1990 I did my first stint as a roving character and coming up with characters. SH: Were you always a general knowledge buff? BM: I was always constantly reading – and not books per se, not novels. There was a magazine from England called Look and Learn. My mother would pick it up from the newsagent along with her copy of New Idea and Women’s Weekly. I would get this mag. It was the broadest range of general knowledge you could imagine. It had stories and graphics and graphs and maps of everything. Doesn’t matter what it was; history, science, culture and I devoured those. I would read them constantly, and to this day I still have facts and information that I know came from reading that particular magazine. In the seventies, Tony Barber was a big star because he hosted The Great Temptation. I remember watching that and learning from that. Obviously, I was barely fourteen or fifteen. So it’s a bit hard to think that some decades later I would be in the same position as those people I used to watch. But that’s where my original understanding of knowledge came from. SH: And then The Great Temptation morphed into Sale of the Century, which ran throughout the eighties. Did you ever try to get on Sale of the Century at the time? BM: Yes I did. I think I may have still been at university at the time. I remember auditioning for it and never got the call. So when Jeopardy! came on air, I remember watching it and going “actually, this rewards you for being clever”. So I auditioned for that and I got pretty much fast-tracked on to it, because they’d started with Tony Barber saying “we really need smart people on this show”. Unfortunately smart people aren’t always the best television. They were trying something Australians were never familiar with, which was not having the news on at six or six thirty in the evening. Putting on a “game show”, (which people thought it was. Which it wasn’t; it was a quiz program), at six o’clock was a big risk… and obviously it didn’t work. Which is why it went off air within six months. It was only about two and a half, three months after I went on air, that the program ended. SH: How far did you go on Jeopardy!, and what did you win? Matt ‘Goliath’ Parkinson – fourth from the left, second from the right. The tall one. You get the idea. This week, as my interview with Matt ‘Goliath’ Parkinson winds up, we discuss resisting temptation, and the favours that a formidable reputation can do you. But first, this recollection from his time as a Sale of the Century champion…. MP: There is one other thing I wanted to say. A really significant moment for me when I was playing Sale of the Century, was when one of my rivals at one stage said something about her mortgage. MP: To me. It was obviously meant to make me feel bad for her and let her win. And you shouldn’t do that; you should not at any stage feel sorry for your opponent. Because people want to see an honest competition, they want to see it played hard and fair and so you should not at any stage think about pulling up or going easy. Don’t be bothered by compassion – it’s a contest. MP: Exactly, exactly. And it’s part of what people want to see when they watch a show like that. They want to go “so he didn’t even let them get one bloody question, the whole game!” If that’s going to happen – if you can do that to people – then go ahead and do that, because that’s one of the things people want to see. MP: One of the things I discovered about Sale – which I thought was really nice, and I didn’t know this – but people would come up to me and say either I owed them a drink, or they would buy me a drink. Because it was quite common with Sale for people to sit in pubs at that time of night and have a little five dollar or ten dollar bet on who was going to win the night. The other thing is to remember that for the audience, some people just want to see a good contest. They don’t care whether they know the answers or not; they just want to see how many you can get right. SH: Did you buy much stuff in the Gift Shop on your run? In this, the penultimate instalment of my chat with ‘Chaser’ Matt Parkinson, I just couldn’t resist the opportunity to ask him straight out…. SH: Do you have any tips for anyone considering going on The Chaser as a contestant? MP: I’ll tell you what; I’ve got some tips for anybody who is considering going on any television show. One thing is to bear in mind that they will get you to sign a contract on the day you go in to play. Now you need to read that contract very carefully because – I don’t know if this is the case with the show I’m on now, but I do know for shows I’ve worked on previously – if your show doesn’t go to air, you won’t get your prize money. That’s a pretty standard thing. I know there have been cases in the past where other people took it to court when they didn’t get their money and the show didn’t go to air. You need to focus not just on getting as many of your questions right as you can, but you need to make sure that there is something about your show that makes them want to put it to air. So in other words, it comes down to three words; Don’t Be Boring. If you can only answer questions effectively in a kind of deadpan, stone-faced, icy state, your show is probably going to get pushed back in the schedule… and they might not want to put it on at all. You might be waiting for your money a long time. Whereas if you are a bit lively and there’s a bit of personality about you while you are answering the questions, feeling registers on your face and you are prepared to play a little bit with the host, then it is more likely that your show will go to air and it will go to air soon. So that was my main tip. Remember that you are making TV. You are not just answering the next question, you are making TV. Having said that, beyond that, your strategy shouldn’t be any more complex than ‘just get the next the question right’. I know there’s a lot of other people try and play – particularly with The Chase, there is room for a bit of strategy, people would say – but I think your strategy on any show like that just comes down to: “you got that one wrong, forget about it”. If you got one wrong, and it’s the sort of show where you get to play more than one show… when you go home, later, don’t worry; you’ll remember all the ones you got wrong. You can sit down and go over them and revise that area. So don’t carry it with you as you go on to the next question. Just forget about it, focus on the next question and get that right. Now that’s a serious face. 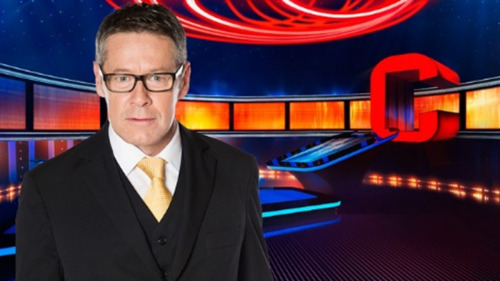 As I continue my chat with Matt Parkinson (who’s currently appearing as ‘Goliath’ on The Chase: Australia) this week, we sidestep for a moment, to talk about his time behind the camera…. SH: You mentioned you’d been setting quizzes on another show; this was another by-product of your Quiz Show Champion credentials wasn’t it? Writing and setting questions for Million Dollar Minute; how long did you do that for? MP: In human years, twenty months. In TV time, 400 shows. I started as a question writer and took over as Question Producer when the original QP had to move on. I should emphasise that I didn’t write all the questions, a team of writers and assistants came up with most of them and I made decisions about content and style. But I still wrote a few, that’s the fun part. SH: What’s the main guiding principle, or rule of thumb, for programming questions for a quiz show? MP: For a mainstream network show, the content needs to be accessible. The audience needs to feel that, even if they don’t know the answer, somebody they know – their mate who’s mad about sport, their kids who know about music and pop culture, the guy at work who reads all the papers – somebody like that would know it. Brevity is also critical – the question can’t be so long-winded that players and viewers can’t take it in easily. SH: Did you have any rules about how you programmed the question mix? Was it, for example, 10% sport, 10% science, 30% arts and entertainment…? MP: After a while, it became obvious that we could have done a whole show just about movies. Science, history, books, maths, even sport, all pale in comparison to how much knowledge most people have about movies. I think this is from two things. One, when people love a movie, they can go online and find out heaps about it quite easily because of imdb and all the other sites written by movie lovers. Two, movie culture is huge, publicity for big movies dominates – I know lots of things about films I’ve never seen just because of the publicity. The short answer is that we made a big effort to balance classic general knowledge with movie-based questions. SH: Was there anything you learned as a question programmer, that made you think “I wish I’d known that when I was a contestant”? If so, what was it? 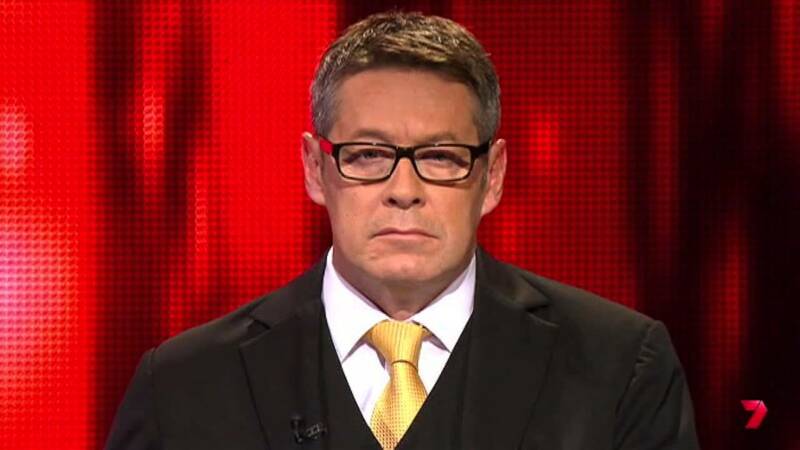 MP: There are many insights I’ve gained from my time on Million Dollar Minute. 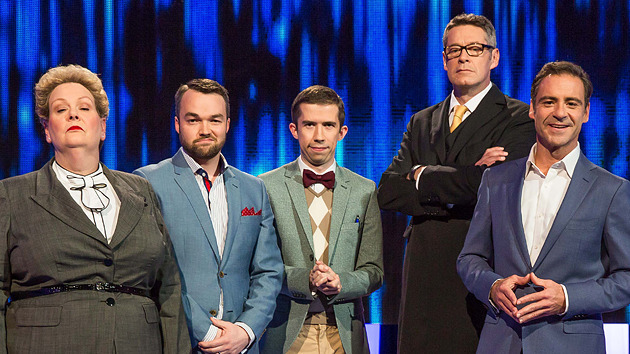 But now I’m competing against all comers as ‘Goliath’ on The Chase. So I’ll be keeping those insights to myself. SH: Fair enough. Is your studying and training for The Chase more like work or more like fun? MP: It’s work now. It’s work now because I’m expected to do it and there is something at stake because I’m part of the team on the show, and the idea is that we’re supposed to be unbeatable. So I wouldn’t be doing my job properly if I wasn’t training. Before this, up until now it was fun. With Sale I didn’t really train very much because I was a bit daunted by the idea of “Where do I start? How far back do I go?” If I pick ‘Formula One champions’, how far back do I go? If I try and learn them all by heart, am I going to go right back to the establishment? So back then it was just the way I lived my life; I read the papers and I watched factual TV and watched the news and paid attention to it all and just sort of sponged things in the way people like us – you, I and the people who subscribe to your blog – the way we do. We just sponge things in. So this is different now; it’s work, so it’s odd trying to consciously do something that always had come naturally to you – to try and consciously up the level at which you absorb something you’ve always just naturally absorbed.